When it comes to building side income streams, I like to break things down into simple terms. For example, we have been tracking our annual dividend income earned for the past 6 years. During that time, we have seen this income source grow by an average of 50% a year. I don’t know about you, but I can’t remember ever getting a 50% raise every year from my employer. While the rate at which our dividends grow in the future will decrease as our total income rises … it will still be at a rate above any cost of living increases I would get from my employer. In addition to keeping track of annual dividends earned (and monthly), there are a few other things I like to watch in our portfolio. These include the average dividends we earn in a day and the 3-month rolling average. As I mentioned earlier … I like to keep things simple. And what could be simpler than breaking down how much we earn on average per day. Back at the beginning of this year (2017), I highlighted the average daily dividend income earned for the past 6 years. So during 2016 … we earned $5.26 per day in dividend income. Doesn’t sound like much, but I disagree. Over the course of one year … that comes out to just under $2,000 of extra income. I don’t know about you … but I could find a lot of ways to use an extra two thousand dollars in our budget. That is 2 months worth of mortgage payments for our family! 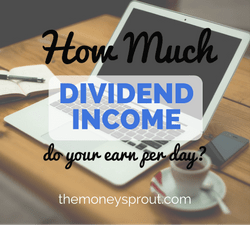 Now that we are 3 months (or 1 quarter) into the new year, I thought it would be good to check back in with our average daily dividend income. For the first three months of the year (2017), we have earned $556.14 … not a bad start but a ways off from our annual goals. That averages out to $6.18 per day for our dividend income so far in 2017. These numbers will only get higher as the year goes by … but we are already averaging almost a $1 more than all of last year! All that is great … but we still have work to do in order to reach our annual goal. Our total dividend income goal for 2017 is to earn $2,400. We will actually need to average about $6.58 per day during the year to reach our goal. If you look at another year from now, we are planning to earn $3,000 in dividend income in 2018. That would mean we need to earn about $8.22 per day next year. Do average daily dividend income totals really matter? No. But they can provide the motivation to keep building this income stream for months and years to come. It breaks things down on simple terms and let’s us know what we need to hit our goals. Another metric that I keep track of with our portfolio, is the 3-Month rolling average for dividend income. As you can tell from our monthly dividend results posts … income earned varies month to month. Normally March, June, September, and December are the biggest income months. That is because over half the companies that we own stock in pay quarterly dividends in those months. The other 8 months of the year are usually close to each other for dividend income. So how can we tell if … say February was a good month? By tracking the 3-month rolling average for dividend income – we can always tell if the portfolio is growing. The calculation is exactly what it says … take the income earned for the last 3 months and take the average. So from our example earlier … we earned $556.14 in dividend income so far this year (January to March). The 3-month rolling average would = $185.38. That number above can tell us a lot. We except it to go up every month. Unless their is a dividend cut made by one of the companies we own. Since we are constantly investing new dollars into stocks and reinvesting the dividends we earn into more shares – the income should be growing. Every once in a while we will see a slight drop in a month. That is normally due to a few companies not paying dividends on consistent months. Or in some cases if we sell shares of a stock and the money from the sale hasn’t been reinvested. But overall … we should never see 2 or months in a row with a decline. Finding out how much dividend income you earn (on average) per day can be a fun and motivating exercise. It is exciting to compare it to past results to see how much your income is growing overtime. For example, our portfolio is now earning $.92 more per day compared to 3 months ago. Calculating your 3-month rolling average for dividend income can also help you see how your portfolio is growing each month. Since companies you own likely pay dividends in different months … taking the average helps predict what your yearly total could be. Do you calculate a rolling average or daily average for your dividend income? How much in dividends do you earn per day?